How many times has a child approached you with something clasped in her hands, eyes alight with wonder and curiosity, to show you a natural treasure she has discovered on your school grounds? The natural world can heighten the curiosity of a child in a unique and wonderful way. And it is becoming more and more evident that establishing a connection between children and nature is important and beneficial. Your school grounds hold the key to harnessing your students’ innate sense of wonder and turning their curiosity into a vehicle for learning science. And not only science: use your students’ interest to spark enthusiasm for math, reading, writing, technology use, and more! The North Carolina Museum of Natural Sciences’ School Grounds Workshops provide teachers with the knowledge and resources they need to take advantage of all your school grounds environment has to offer! Reawaken your own sense of wonder. Discover the free resources that exist right outside your door. Take away resources to use in your classroom. Create or enhance a habitat area on your school grounds. All workshops are conducted in a manner that demonstrates the concept of Science as Inquiry, including working in small groups, conducting investigations, and practicing careful observation. Workshop science content is most applicable to the Life Science and Earth Science strands of the Essential Standards. However, student interest in the natural world provides a bridge to many other subject areas and concepts in the Common Core Standards: reading informational text; critical thinking and analytical skills; writing; math skills and concepts, and solving real-world problems. For information, contact Melissa Dowland, Coordinator of Teacher Education, at 919.707.9898. Cost: $1600 (includes classroom materials and equipment for each topic/session and native plants or other habitat enhancement materials). Capacity: 16-24 participating educators in most sessions (teachers, aides, administrators, involved parents). Applications for the 2019-20 school year are due April 17, 2019. Six workshops over the course of a school year to help foster a culture of outdoor awareness and environmental stewardship at your school: one session for a leadership team, four sessions for teachers/aids/volunteers, and one session in which students participate in the installation of a wildlife habitat of your choice. Workshops cover topics and resources that are available on your school grounds in different seasons, encouraging the use of the outdoors all year long! Materials that support the program and allow teachers to easily implement activities including tools and equipment, field guides and other references, activity guides and handouts, and plants and other resources for your habitat project. A session with students to create or enhance an area for wildlife and learning on your school grounds. Typical projects include butterfly gardens, bird observation areas, and water gardens/mini ponds. To be considered for the 2019–2020 school year, please review the UTOTES Workshop Schedule and submit the three online application forms no later than April 17, 2019. Schools will be notified of the selections in May. Register at least four weeks in advance. Let Museum naturalists open your eyes to the amazing variety of native plant and animal life found on your school grounds. Gain activity ideas and content to help you become more comfortable using the outdoors as a classroom. We will tailor this workshop to the resources you have on YOUR school grounds! Register at least six weeks in advance. 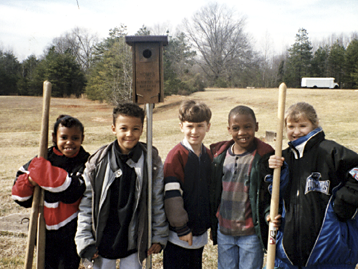 Learn about the important features of a wildlife habitat and how to create one on your school grounds, and then install it with the assistance on Museum staff. Students are welcome to participate in the installation portion of the program (second session). Topics include butterfly gardens, bird observation areas and school grounds wetlands. Other habitat features may be arranged on request.